Yvette Cormier’s brows furrowed when she was asked what she thought about being on the National Mall to see President Donald Trump’s swearing-in ceremony. She was here for both of President Barack Obama’s inaugurations and thinks that today wasn’t the same at all. Cormier and her son, Drew St. Lawrence, who lives in Brooklyn, N.Y., were standing on the Mall watching a crowd that was not nearly as large as those that thronged Washington, D.C., in 2009, or even in 2013, when fewer showed up for Obama’s second swearing-in ceremony. Cormier smiles just thinking back to 2009. “We spent the night at Union Station. People were running and cheering. It seems even the people who support [Trump] aren’t that enthusiastic,” she says. 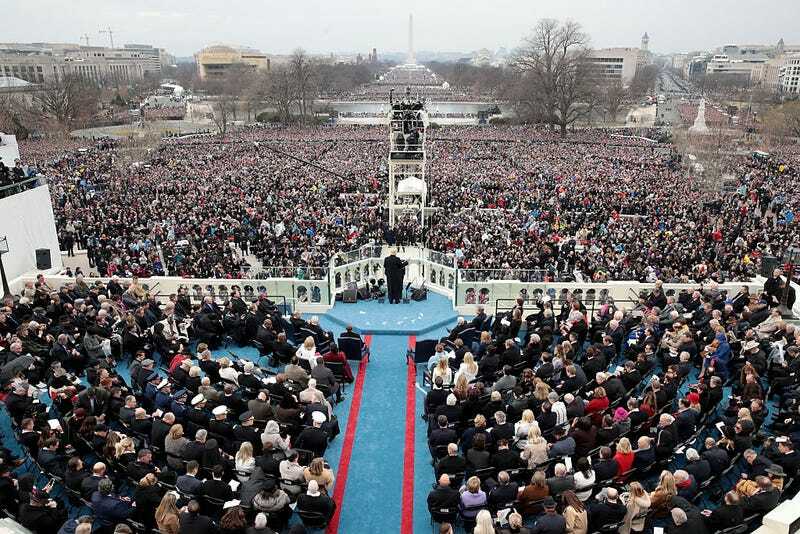 Unofficial estimates put the total attendance at Obama’s first inauguration at about 1.8 million. The Mall was so full of people, you could barely get through the crowd, from the U.S. Capitol all the way back to the Washington Monument. The streets were full of smiling, joyous people of all colors, although there were huge numbers of African Americans. People hugged one another and cried and walked the Mall in huge numbers for days before the official ceremony, buying souvenirs and taking pictures. There were also supporters of President Trump around town and on the Mall over the past few days, and while they were excited and happy, many in D.C. who supported the outgoing president were not. Cormier’s son echoed several others who spoke with The Root. Barbara Mellinger of Florida not only voted for Trump but also volunteered at his rallies. Bundled up in a red-white-and-blue hat and scarf, Mellinger was grinning and shivering a little in the cold. She has a message for those who are feeling that America is a divided nation and that Trump will widen the political chasm. But compared with the last two inaugurations, there was more angst in this crowd, and a tangible feeling of victory for Trump’s supporters, along with a bitter vibe of loss and anger from those who supported Hillary Clinton and Bernie Sanders. Those selling Trump souvenirs told The Root that business was brisk, but some weren’t getting the frenzied level of buyers who turned out for the Obama inaugurations. There were also people selling swag touting the Obamas, and some in the crowd wore Obama T-shirts, hats and scarves. But they were far outnumbered by folks wearing the red-and-white “Make America Great Again” hats and other paraphernalia, and many on the Mall were wearing red, white and blue. Janet Gurwell of Suffolk, Va., was among them. Despite the enthusiasm of supporters for Trump, it seems that those protesting are also filling up hotels in the nation’s capital. Some concierges are worried about clashes between the two groups. Also, there are still rooms available in many hotels, if you were to check in today and check out Sunday, that are usually sold out. It’s usually pretty tough to find rooms around inauguration, according to Bill Craven, who has handled logistics for various organizations since the first Ronald Reagan swearing-in ceremony. Back on the National Mall, Debbie Matesun, 17, said that she is here with the Virginia-based student career-and-leadership program Envision to witness history, but not to support this president. The Philadelphia native, who proudly touts her Nigerian heritage, said that there are things President Trump could do to make her feel better about his tenure in office.